TOKYO--(BUSINESS WIRE)--Toshiba Memory Corporation, the world leader in memory solutions, today unveiled a new, game-changing category of SAS SSDs expected to replace SATA SSDs in server applications. The RM5 12Gbit/s value SAS (vSAS) series features capacity, performance, reliability, manageability and data security advantages – at a price that obsoletes SATA SSDs. A homogeneous SAS environment has long been the gold standard for enterprise server and storage systems. With vertical integration expertise in flash technology, firmware and controller design, Toshiba Memory Corporation leveraged its leading position as the world’s leading SAS SSD line optimizing RM5 to close the cost gap with SATA – and usher in a new class of SSDs. SATA simply cannot compete with SAS, falling well short in terms of performance, robustness, and encryption options. 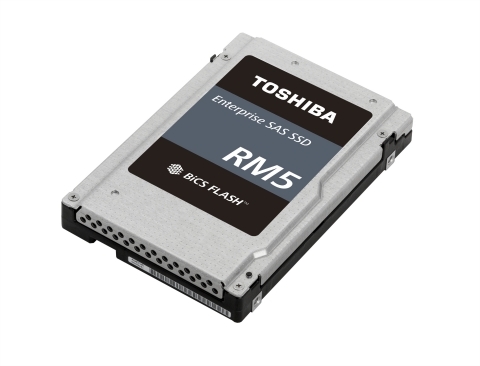 Designed with affordability and server applications in mind, Toshiba Memory Corporation’s RM5 vSAS series seeks to provide a cost effective and much higher performing solution to overcome the bottlenecks that are inherent with SATA today. Where SATA drives often use SAS expanders to scale out, the RM5 enables the use of native SAS from end-to-end, eliminating the need for protocol translation to SATA. Customers can now take full advantage of SAS’s richer feature set and realize performance throughput superiority over SATA. Featuring Toshiba Memory Corporation’s BiCS FLASH™ TLC (3-bit-per-cell) 3D flash memory, the RM5 series will initially be available in capacities up to 7.68TB with a single 12Gbit/s port, SFF-8639 connector and in a 2.5” form factor. Sample shipments to OEM customers start today in limited quantities, and Toshiba Memory Corporation will gradually increase shipments from the third calendar quarter of 2018. The RM5 series will be exhibited at HPE (Hewlett Packard Enterprise) Discover in Las Vegas, U.S.A. until June 21, in the Toshiba Memory America booth #196. *All company names, product names, and service names mentioned herein may be trademarks of their respective companies. Definition of capacity: Toshiba Memory Corporation defines a gigabyte (GB) as 1,000,000,000 bytes and a terabyte (TB) as 1,000,000,000,000 bytes. A computer operating system, however, reports storage capacity using powers of 2 for the definition of 1GB = 230 bytes = 1,073,741,824 bytes, 1TB = 240 bytes = 1,099,511,627,776 bytes and therefore shows less storage capacity. Available storage capacity (including examples of various media files) will vary based on file size, formatting, settings, software and operating system, such as Microsoft Operating System and/or pre-installed software applications, or media content. Actual formatted capacity may vary. Toshiba Memory Corporation unveiled a new, game-changing category of SAS SSDs expected to replace SATA SSDs in server applications.